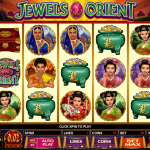 Jewels of the Orient is an older Microgaming slot with an Oriental theme. On the reels of the slot we have a chance to travel to the distant orient and see what it has to offer. This is a very popular theme in the online gambling industry and almost every software provider has at least one Oriental slot game. Jewels of the Orient has a simple design with low level animations, but the symbols have great details and the choice of colors is spot on. To make the slot more appealing to players the designers installed a great bonus feature capable of producing big payouts. The first detail you will notice in the game is that the symbols can land stacked across the reels. This feature immediately increases the payout potential of the slot. The Wild symbol in the game comes with a 2.500 coins maximum payout and will substitute for all of the game symbols except the scatter. Once 3, 4 or 5 scatters land anywhere on the reels the free spins bonus is triggered. Before the free spins start players will need to make picks on three different levels. There are three boxes to pick from and in the first level the chosen box awards a random number of free spins. If the bonus was triggered with 3 scatters you can win from 10 to 15 free spins, with 4 scatters 15 to 20 free spins and with 5 scatters 20 to 40 free spins. In the second stage you choose a box with a multiplier which can range from x1 to x5 and in the third stage you get a bonus win which can range from 5 to 120 x stake. 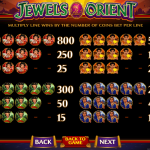 Jewels of the Orient is a great Microgaming slot which has a lot to offer in the bonus round. With up to 40 free spin on a x5 multiplier and a 120 x stake bonus win the slot is well worth trying for real play. Not the game for you? Well the next one doesn’t need any introduction: Jekyll And Hyde a 5 reel slot by MicroGaming.